Namo Buddha is one of the most sacred Buddhist pilgrimage site of Nepal. 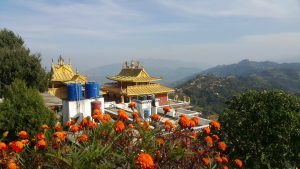 When we were planning for a trip we were searching for some astonishing place nearby Kathmandu foothill; a destination with delightful hiking, scenic and wonderful views to gather up and strengthen our mind in search of peace and wisdom and relish the utmost purity of soul and peace of mind. Namo Buddha became the best option for us. 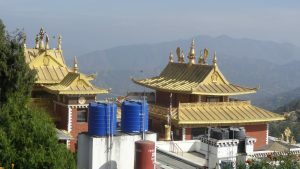 It is 40 km southeast of the Kathmandu valley and is very much idolized by the Buddhist pilgrim from all over the world. The monastery has a marvelous structural design and serene ambience, it is named as Thrangu Tashi Yangtse monastery. Namo Buddha in its meaning is “Greetings to the Lord Buddha”. The surrounding is populated by ethnic Tamang settlements. There is a legendary tale related to the history of the Monastery; how a young prince sacrificed his life in order to satisfy the hunger of a tigress. On our urge to know more about the tale we got the information: On a hunting tour, a prince saw a hungry tigress with her cubs. The tigress was on a very miserable condition as she couldn’t even walk for her hunt. Seeing such situation the prince cut and fed his flesh and blood to the tigress’s family. The same prince is believed to be reincarnated as Siddhartha Gautam. Our trip started from Kathmandu, we gathered early in the morning and hired a bus towards Dhulikhel. With a group of 18 friends it took us nearly 4 hours of hiking from Dhulikhel to reach for the top of the hill. The astonishing thing was that on each hourly interval we were informed that it would merely take an hour to reach the destination. We didn’t forget to capture photographs of those breathtaking views and landscapes. From the top there were the best views of Everest and Langtang Himalayan range. On our entrance to the Gumba, the sanctifying potency was potrayed as a group of tourist were breathing with the names of Lord Buddha and repeating the words again and again. The sight of some monks working on daily routine basis of keeping the place neat and clean reminded us of the necessity of disciplines and purity in ourselves. The place has a lot to offer as learning could be possible from every corner our eyes could reach. The way the Cherry/Sakura flowers were blooming had surely enhanced the beauty of the place. We gained a lot of knowledge regarding the traditional ethnic settlement of Tamang. We even committed ourselves not to use smart phones throughout our journey so that we could spend whole time within ourselves. This memorable trip had some best moments of tranquility locked up in our heart forever. After all, it was the place where the inspirations had been planted by Lord Buddha himself, how could we not get inspired to face the challenges on the upcoming days. We were now ready for any challenges that could head towards us. We will fight and conquer our hurdles with peace of mind, calm in power and willpower to overcome.